Too many times, ok, darned near every time I hit the trail or otherwise head into the woods the breakfast du jour is oatmeal. You see, though, I don’t really like oatmeal that much. It’s just easy to dump some water in the bag, stir it up, and choke it down. This time it’s going to be different! Since we’re going to base camp at Reflection Lake I’ve decided to spruce up the menu a bit. 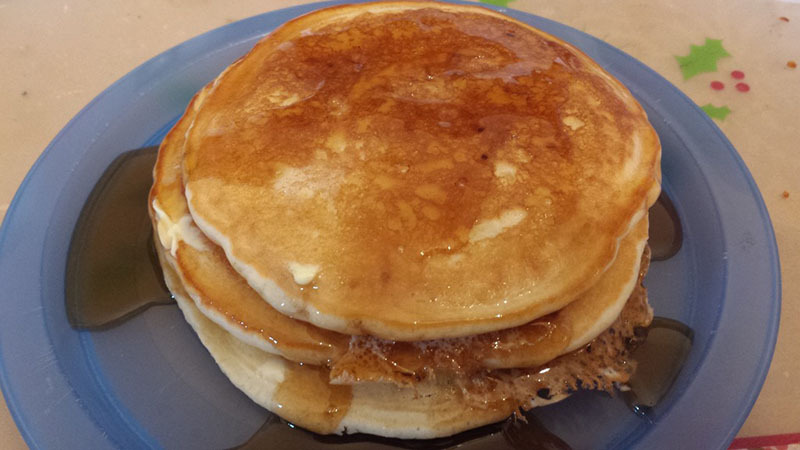 This morning it was time to try out one of my new trail dishes…pancakes. I’ve actually waffled on this (no pun intended, of course). It’s additional weight both in the mix and the syrup. However, after the trial run I’m convinced it’s the right thing to do and I think it’ll go a long way to lift the trail breakfast out of the mundane and propel it into the stratosphere. Ok, maybe that’s a bit much, but you get the idea. In an effort to keep expenses to a minimum I decided to try Wal-Mart’s Great Value mix. 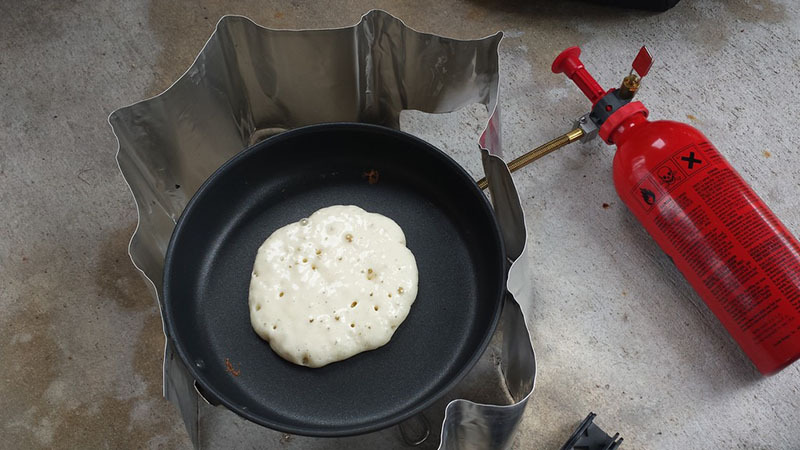 It’s about a buck and makes a surprising amount of pancakes. You can easily get eight decent cakes out of and maybe even ten or so. My first ones were on the larger size so had I scaled back I could’ve stretched it out. I simply cut the top of the package open about to the “Just Add Water” line. This gave me enough room to keep the contents inside without getting my hand all messy while whisking. My mini whisk is a little too mushy and flexes a good bit. This left me with some unmixed powder at the bottom despite thinking I’d done a great job. Perhaps a little more time with the whisk would’ve rectified the problem. It wasn’t bad enough that it bothered me. 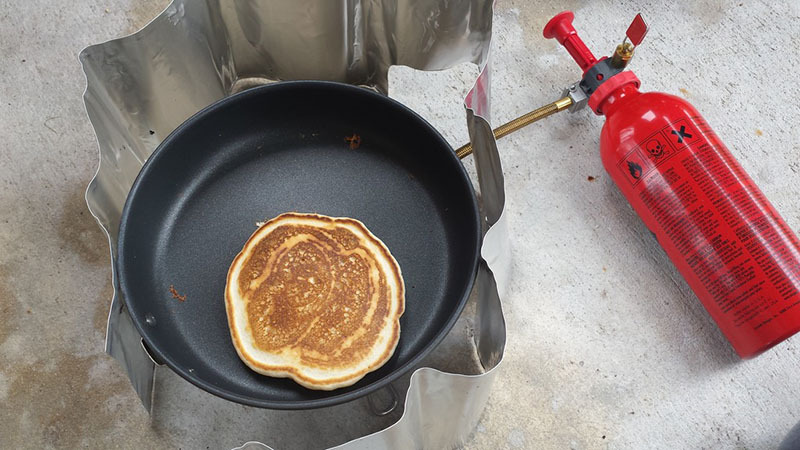 I fired up my now trusty MSR Whisperlite and dropped my 7″ nonstick pan on the supports. In no time the bubbles were forming and golden paradise was on the way. My son and his friend were riding their bikes while I was in the backcountry porch and stopped by to see what I was doing. My son mentioned a couple of times how good it smelled. The Whisperlite can be a little tricky to get the flame just right. I seem to teeter on the edge between flaming out and roaring. 🙂 If you keep the heat low, though, you can get a nice, golden brown. Too hot and they’ll burn quicker than you can say something that’s easy to say. This is Florida in August (wow, can you believe it’s already August) and between the heat from the stove and the sweltering Florida heat itself I was already sweating up a storm. Once the stack was done I headed back inside to the nice A/C. Poured a quick cup of cold milk, slathered on some butter, and lovingly coated my sweet cakes with syrup. Oh what a breakfast.